The richest player at the end of the game is the winner. 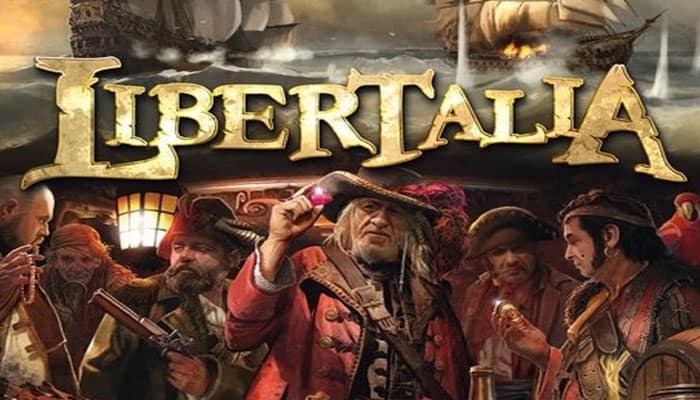 With their help, The author would like to thank, Libertalia will come to life! Place the board in the middle of the table. Each player randomly gets a color by drawing a face-down crew marker card and gets the den, the crew marker card, the score token, and the 30 cards of that color. The players place their den in front of them and their cards next to it. Place the score track to the side. Each player places their score token on the "0" space. Each player gets 10 doubloons (1 of value 5 and 5 of value 1). The remaining doubloons are set aside and form the bank. Place all booty tokens in a bag and shuffle them thoroughly. 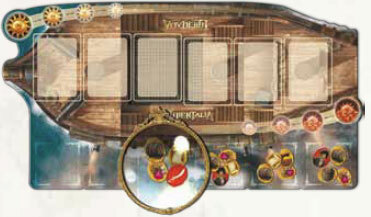 Draw 1 booty token per player per day of the campaign and place them on the various spaces under the ship which will be looted by the players (example: 24 booty tokens for a 4 player game). During a 4 player game, each space under the ship must contain 4 booty tokens. The youngest player shuffles their character cards and draws 9. They read the number (the rank) and name out loud so that each player chooses the same cards as them. Each player takes these 9 cards in their hand. At the start of the first campaign, all the Player's Den players will have in hand the same 9 characters. The other characters are set aside for the moment and will only be used during the other campaigns which make up the game. In order to avoid confusion, each player places their crew marker card face up on their unused cards. The game takes place over 3 campaigns. During each campaign the players will resolve 6 days of looting (from the sunrise phase through the night phase) and 1 day of rest during which their riches will be totaled. During the 6 first days of a campaign, each player will secretly play a character card from their hand onto the ship in order to try and get shares of the booty. During the day of rest, the riches of each player are totaled, noted on the score track and the next campaign is prepared for. When all three campaigns have been played, the richest player is crowned the winner. Each player secretly chooses a character card from their hand and places it facedown on the table in front of them. When all the players have done so, the cards thus played are revealed. The youngest player places all the characters in increasing order of rank on the spaces on the ship which are set aside for that purpose. If multiple players have played the same character, the influence of the characters (the value in the silver mark) allows players to sort them in order of rank: whoever has the greatest value in their silver mark is of higher rank. In increasing order of rank (so from left to right), each player will resolve the "day" special action of the character they've played. It's time to share the booty! In decreasing order of rank (so from right to left), each player will choose a booty token from the space under the ship corresponding to the day played. Example: during the 3rd day, the players will loot the third space to the left under the ship. The "dusk" special actions (which generally affect the sharing of the booty) are resolved at the same time and in the same order. If a player chooses a Spanish officer or a saber tile, the player must immediately resolve their effect (see inset). Otherwise, the player places the chosen booty token face-down in their den. The player's character is then placed in the player's den, face-up. The booty tokens that remain (eventually) at the end of this phase are left on the board until the end of the current campaign. Players all resolve this phase simultaneously. All characters present in their dens use their "night" special actions. All players resolve this phase simultaneously. All characters present in their den use their "end of the campaign" special actions. Chests are worth 5 doubloons. Jewels are worth 3 doubloons. Goods are worth 1 doubloon. Each set of 3 treasure maps is worth 12 doubloons. Sets of 1 or 2 treasure maps are worthless as they are incomplete. Each cursed relic makes you lose 3 doubloons. Sabers and Spanish officers are worth nothing. 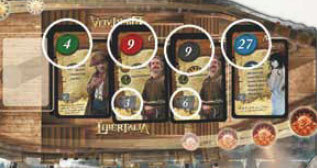 The players then move their score token a number of spaces equal to their total fortune (in doubloons) on the score track. 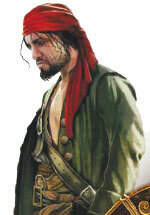 Their final score will be the sum of all doubloons won during the three campaigns. The characters in the graveyard or in the players' dens are removed from the game (they will not be used for the rest of the game). All bootytokens are returned to the bag. All the doubloons are returned to the bank. Players should have in hand only the 3 character cards which they haven't played during the previous campaign (some characters played may modify the number of cards kept). Each player gets 10 doubloons (1 of value 5 and 5 of value 1). The remaining doubloons are set aside and form the bank. The youngest player shuffles the remainder of their deck of cards and draws 6. They read the number (the rank) and name out loud so that every other player can select the same cards as they did. Each player takes these 6 cards and adds them to their hand. Each player will thus have 6 cards which will be identical to those of the other players, plus the 3 cards which have been kept from the previous campaign. The game takes place over 3 campaigns. The player whose score token has reached the highest value on the score track at the end of the third campaign is crowned the winner.